Below you’ll find a complete list of Royal Caribbean Ships by Size. If it has an “of the Seas” in its name, then it’s included in our ship size comparison infographic. From its first Empress of the Seas to the newest Spectrum of the Seas (scheduled for 2020), you’ll find the smallest to the largest Royal Caribbean ships here. To give you an idea of just how far we’ve come, check out the bottom of the size comparison chart. Royal Caribbean’s earliest ships held roughly 2,500 people including guests and cruise staff. Compare that to the top where you’ll see the Harmony and Symphony with nearly 9,000 people roaming the ships’ halls. That’s over 3x the size! First, we have to get something clear. We’re measuring Royal Caribbean ships by size according to the metric, “Gross Tonnage.” This always causes a bit of confusion amongst our community members. It’s not simply “weight” that determines this size measurement. The definition is technical and boring, but we’ll provide it anyway. We told you it was boring! So why do we use this measurement to determine Carnival Ships Size? As noted above, it’s used for safety rules and whatnot. As such, it’s prevalent. Every passenger cruise ship will have this metric. That makes it easy to compare ship size across ship, class, line and more. Click above to pin this Royal Caribbean Ships by Size Infograph to your favorite cruise planning board, so you can refer back to it when choosing your next ship! That’s every Royal Caribbean Cruise Ship currently active in their fleet. We’ve also stuck in an upcoming vessel (Spectrum of the Seas) and a few that have since been retired. You can see the vast difference in ship size below comparing the smallest to largest! Here’s a visual representation showing the Empress of the Seas to the Symphony of the Seas. The experience on these two cruise ships will be drastically different! It’s like shopping at the corner store vs the “Mall of America.” Different cruisers have varying preferences. Some of you prefer familiarity and intimacy. Others want novelty and don’t mind walking long distances. There are no bad options here! Not only is the Symphony of the Seas the biggest of Royal Caribbean’s fleet. It’s also the largest cruise ship in the world! To find your specific RC ship, feel free to use our menu below. Clicking on any will let you quickly jump to that ship’s stats. 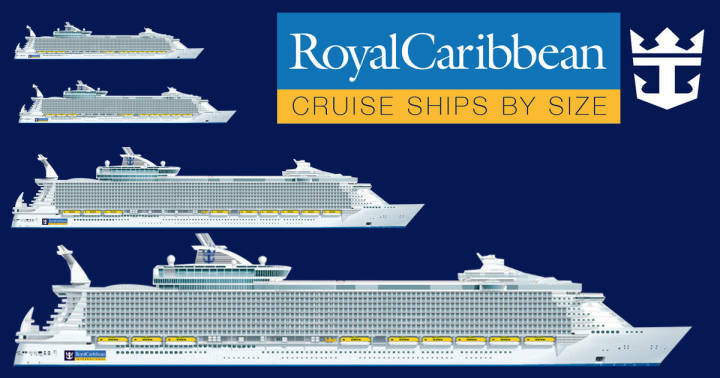 Below we’ve listed all Royal Caribbean Ships by size, including a bit more info. You’ll find the following metrics: gross tonnage; ship length; year built; total staterooms on board; passenger capacity; and crew members. We hope that the above list of Royal Caribbean Ships by size help you to find your ideal cruise. If interested, we also have a post showing Carnival ships by size. Please use the “Share” buttons below to help other RC fans find this sizing info!